Josh Warrington would be open to a rematch against Carl Frampton - but only if the Northern Irishman has a world title to defend. 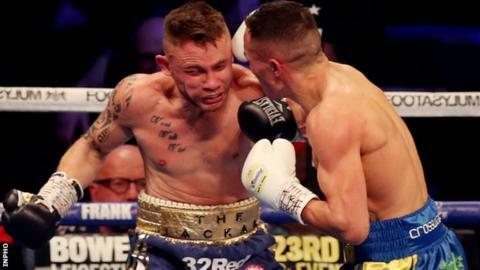 Warrington beat Frampton in his first IBF world featherweight title defence and will face Kid Galahad on 15 June. Frampton has ended talk of retirement by signing a new multi-fight contract with US-based Top Rank promotions. "Maybe I should have got chinned then I would have got that opportunity," said Warrington of his rival's new deal. Frampton's next opponent for what will be his 29th professional fight is expected to be announced shortly. The 32-year-old has been touted as an opponent for world title holders Oscar Valdez or Leo Santa Cruz.